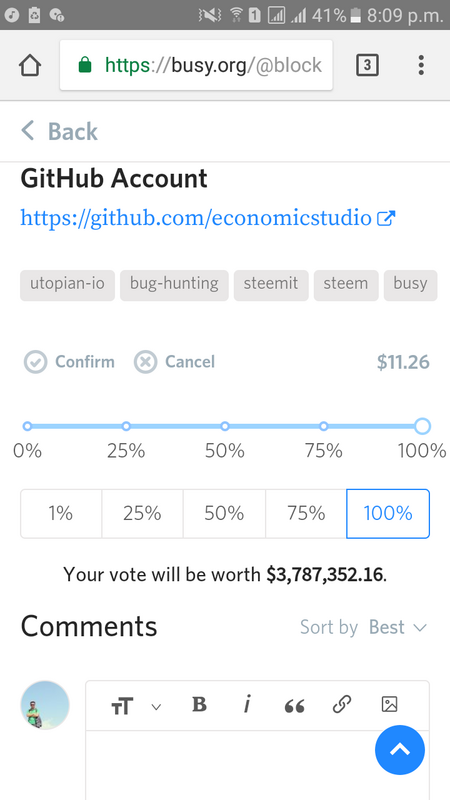 When I enable the slider option in voting in busy.org, it must show the actual voting worth of my account. When I click on the upvote option in a post (with slider option for voting enabled), it shows very high vote worth which is not actually your vote worth. Log in to busy.org . Enable slider option for voting from Settings. Now click upvote and see the vote worth under the voting slider. The vote worth is much more than your real vote worth. Hi @neupanedipen, it's been a while since you last contributed to the category, its great to have you back. Thanks for making this contribution. I was able to replicate the said behavior. The error in estimation can also be noticed to the left panel of the user's profile page. Submission title should include the app name and version number, as well as a brief description of the occurring issue ([Product Name] [Product Version] – Succinct description of the bug). The discrepancy between what is expected and what is currently at play is very well explained. Thank you for your review, @fego! Keep up the good work! Congratulations @neupanedipen! You received a personal award!